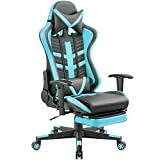 There is a huge selection of computer gaming chairs available which is great when it comes to finding the color and style that best suits your game room setup. However it can be a challenge to figure out which brand and model of racing chair is the best one for you. Here are a few important factors which can help you decide which chair is the best fit for you. 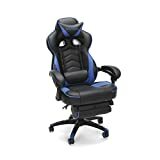 Always read the description and features carefully to ensure that you are buying a PC or video game chair that fits your needs. Not all gaming chairs are equal when it comes to seat size. Some chairs are designed for big and tall gamers while other are most suited to those with a thinner waist line. Buying a chair that is too small for your body size will result in extreme disappointment! Another important factor that must be considered is the maximum weight capacity of the chair. Some models are most suited for 200 lbs or less while others can accommodate up to 300lbs or more. Making sure that the model you choose can hold your body weight is essential. Looking for the ultimate in comfort while you game? Then you will want to make sure to find a chair that offers all the bells and whistles. Adjustable headrest and footrests are available on many models of chairs. Swivel and reclining features vary by model so always check the description to see if a particular model offers the ergonomics you want. 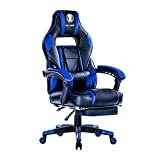 Most gaming chairs use a covering of PU Leather which is a synthetic material that is easier to keep clean then genuine leather. Some chairs are available with real leather but are much more expensive and harder to maintain. Other materials found on some chairs are fabric, cloth or vinyl. 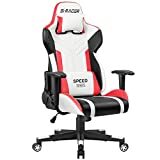 You want your gaming chair to last a long time and be problem free so look for brands that offer longer warranties and stand behind their products in case of any issues. 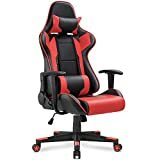 Use the product descriptions found in this website to compare the many brands and models of computer gaming chairs available in order to help you decide on the best one for you.